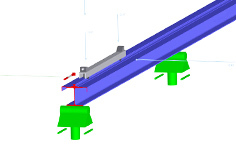 Can additional individual loads for the crane runway girder be defined in the add-on module KRANBAHN? Unfortunately, this is not possible so far. The additional loads can only be considered as equal load over the whole carrier.